No really I’m not making the name up, and I have proof below. This might be one of the best, if not the best nail polish name ever. Fuckyeah is a super bright, nearly neon purple/fuchsia creme. It’s new for summer 2012 and limited edition. Bright ain’t she? The color is a fuchsia/violet purple, but leans more towards violet in real life. I actually adjusted this photo a little because in photos it looks very pink, and it’s really not. It does dry pretty matte (which I have noticed with most nail polishes this shade for some reason) so I used a top coat here. The formula is nice, not too thick or thin. Even consistency, and I only needed two coats. Pricing: $16.00 for 0.5 oz. Note: Sheswai is cruelty free. Haha! LOVE the name! I wonder if others in the same collection have awesome names. This is one polish I would buy just for the name. The color is nice 2. This doesn’t come from a collection, it’s just on its own. LOL I love the packaging and the shade! The name is fun as well. Kind of makes me giggle like an 8th grader! Sunny @ Mostly Sunny´s last post…For Summer 2012, L’Occitane Brings You Fresh Verbena from Corsica… with a Citrus Twist! Ahaha awesome name! The bottle is cute, too! Yeah I love their bottles, really pretty. lol at the name. I like that it’s deep/intense but not dark! Yeah it’s really quite bright! Love the name but the color is pretty too! It would be worth buying just to see someone’s face when they ask what the color is and you tell them. Arielle´s last post…The Addiction is Now Public! That’s a great name also. OMG! That is so funny. I love that color and will definatelybe trying it out. Fuckyeah! It used to be that I didn’t care at all for berry shades, but this one is HOT! It is a pretty color, has nice packaging, and who can beat a name like Fuckyeah! Both the name and the color definitely get your attention! Very prettybut its too spendy. Love the color and the name, haha! Cute packaging and awesome name, LOL! Oh yeah, the color is nice too! Gloriously awesome color! I can’t believe 8 people said “NO THANKS”??? I love the name AND the colour. I admire their guts! The name seems to be a sly nod to the tumblr meme. I also wonder why this shade is usually fairly matte no matter who makes it. Awesome, awesome name. Also love the bottle! Hilarious name…and it’s gorgeous to boot! I really like the packaging, it it too cute. It’s so pretty! Been trying to find a shade like this! If you have it, can you do a comparison between Fuckyeah and Sinful Colors Dream On? Not paying attention, scrolling through my blogroll I thought maybe this was a new Tarte product from the packaging! Love the color, love the name, and the packaging is to die for!! Color is AWESOME, but I’d buy this beauty for the name alone–HILARIOUS!!! pretty, great name, but expensive! 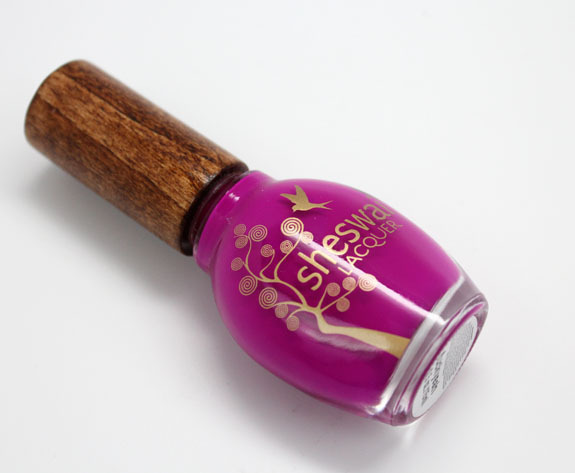 Name of the nail polish is crazy but colour and the bottle are beautiful. I literally went straight to their website and ordered this! Thanks for posting, it’s awesome! I ordered this because of the color & name, it’s really pretty color! Would love to see a comparison between this and China Glaze Neon Purple Panic (I own the latter so am wondering if there’s a point to buying this one). Thanks! JEEZ! IT’S ABOUT TIME! Haha! I’ve only been into polish for about a year – although I’m a lifelong cosmetics addict – and one thing that drives me up a freaking wall are the asinine names companies come up with. (Indie brands – this goes for you, too!) I have boycotted shades just because on the name! I realize it’s got to be difficult to come up with hundreds of them, but come on! Some companies are managing to come up with new ideas! I just got Fuckyeah (LOVE the name…and it’s one of my favorite shades of magenta/fuschia) and Yowza. Everything about these bottles just makes me swoon! I can’t decide if Pahlish “Glittoris” or Sheswai “Fuckyeah” is the best name ever….I’m so torn lol. ManicuredSlayer´s last post…The Contest is Closed, but the party goes on!